The North British Railway (NBR) Class N (LNER D35) locomotives were designed by Holmes specifically for the West Highland Railway which opened in 1894. Two batches of six were built in 1894, and would appear to have been initially sufficient for the West Highland Railway. They were followed by two more batches in 1896, resulting in twenty four locomotives in total. The D35's association with the West Highland line led to them being known as the "West Highland bogies". Unusually for a Holmes 4-4-0, the reversing gear was operated by a lever, instead of a vertical screw. Steam heating apparatus were installed on all of the D35s, but connections were only provided at the tender end. 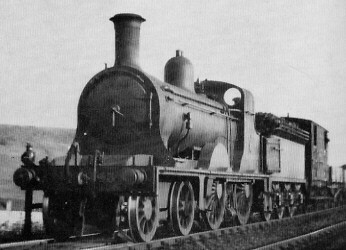 Unlike Holmes' other 4-4-0 designs, the D35s were poor performers and had a poor reputation. The chief complaint was the lack of adhesion. Reid attempted to correct these problems with a major rebuild of No. 695 in 1919. The results of this rebuilding did not justify the cost, and no further locomotives were rebuilt. No. 695 was given the new classification of NBR Class L (LNER D36). Most of the D35s were initially allocated to the West Highland line. Engines were typically allocated to Cowlairs and Fort William. After the Mallaig extension was opened in 1901, a D35 was usually allocated to Mallaig as well. The D35s were also used on local services around Glasgow and Clydeside, including workmen's trains, residential traffic, and cattle specials. By about 1905, the D35s were displaced from the West Highland line by more powerful 4-4-0s. New duties in this time period included stopping trains from Glasgow to Edinburgh, and pilot duties at Galashiels. By World War One, many of the D35s were used for pilot duties at such places as Duddington, Dunbar, and Inverkeithing. The failure of No. 695's rebuild in 1919 led to the immediate and rapid withdrawal of the D35s. Seven engines survived into LNER ownership, but the rapid withdrawal programme continued and last D35 was withdrawn in 1924. Final LNER allocations were Dunfermline (Inverkeithing pilot), Haymarket, Eastfield (local passenger services), and Bathgate (stopping trains to Edinburgh). The last D35 was withdrawn in 1924, and none have survived into preservation. Connoisseur Models produce a brass kit of the D35 for O gauge (7mm scale).